Born in Glasgow on May 27 1887, the third of six children of actor and theatre producer John Clyde and his wife Mary, he appeared in his father’s travelling plays throughout Scotland and decided on acting and directing as a career. Leaving the family behind in Helensburgh, he went to London, and by 1924 was a member of the Garrick Theatre Company. Next he went to America with his Birmingham-born character actress wife Gaby Fay, and worked in both cinema and theatre before moving to Vancouver, Canada. He part-owned the Empress Theatre at Hastings and Gore, Vancouver, and spent several months refurbishing it. On November 2 1929 it opened for the inaugural production of what would turn out to be Vancouver's last — and arguably the best — repertory theatre company before World War Two, the British Guild Players. 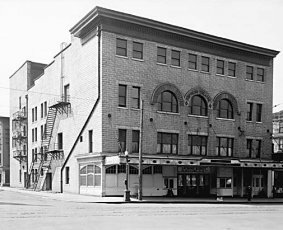 Built in 1908, when it was hailed as the largest theatre west of Chicago, the Empress (below) had housed a succession of stock theatre companies, with stage lives of anywhere from a few months to four and a half years. The primary producers for the British Guild Players were David and colleague Norman Cannon, whose stage career had been primarily in cities outside London and who was the other part-owner of the theatre. From 1929 to 1931, Basil Radford, who had been touring in America and Australia, was a member of the company. These were no bit players — they distinguished themselves both on stage and later in film. Gaby Fay, who was the principal leading lady in many of the Players productions, bought a house for herself and David in Vancouver in 1930. 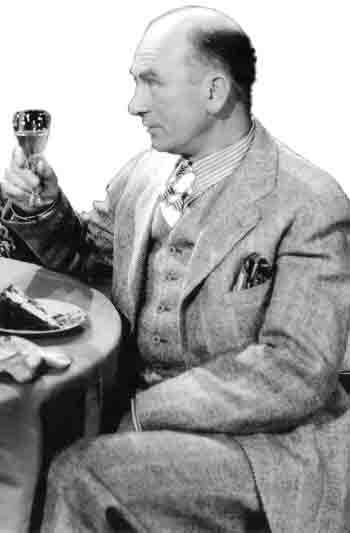 Radford returned to England's stage and screen, and one of his memorable roles was in Hitchcock's The Lady Vanishes. From 1929 until November 1933, the British Guild Players defied the Depression, and competed with touring companies, radio, and talking pictures to produce current London and Broadway hits, often a new play every week. It seems clear that they left Vancouver only when talking pictures proved insurmountable. David and Gaby went to Hollywood in 1934, and he appeared that year in his first film Molly and Me. Regular screen work followed, and in all he appeared in 87 movies, the last being Devotion, first screened in 1946 — the year after his death. He was also a successful businessman. His bigger roles included T. P. Wallaby in W.C. Fields' Man on the Flying Trapeze (1935) and Canadian constable Thompson in the excellent Sherlock Holmes opus The Scarlet Claw (1944). Stars he worked with included Bette Davis, Katharine Hepburn, Ava Gardner, Greer Garson, Vivien Leigh, Olivia De Havilland, Ronald Colman, Cary Grant and James Stewart. He died on May 17 1945 in California’s San Fernando Valley, and is buried in the Forest Lawn Memorial Park in Glendale, Los Angeles. His wife Gaby, born Dorothy Fay Hammerton on September 26 1895, appeared as a dancer on the British stage by the age of nine, and later turned to acting. Eventually she worked with California's Pasadena Playhouse. In 1936, two years after the couple moved to Hollywood, she made her screen debut. At first she was billed as Gaby Fay, which she soon changed to Fay Holden. For the next two decades she played supporting roles in numerous films, frequently cast as a warm, devoted mother. She is perhaps best remembered as Mickey Rooney's wise and loving mother in the popular Andy Hardy series — and was selected by various groups as ‘the ideal American mother’. She was also selected for the Who’s Who of American Women. She retired from the screen after 1958, and died on June 23 1973 in Woodland Hills, California. The Deputy Lieutenant of Dunbartonshire, Lieutenant Commander Gill Aitkenhead MBE, RN Rtd., who lives in Helensburgh, is David’s first cousin twice removed. Another relative living in the town is whisky executive Alistair Paton. The picture of David alone is from the 1936 film Suzy, a First World War romance in which he appeared with Jean Harlow, Franchot Tone and Cary Grant. 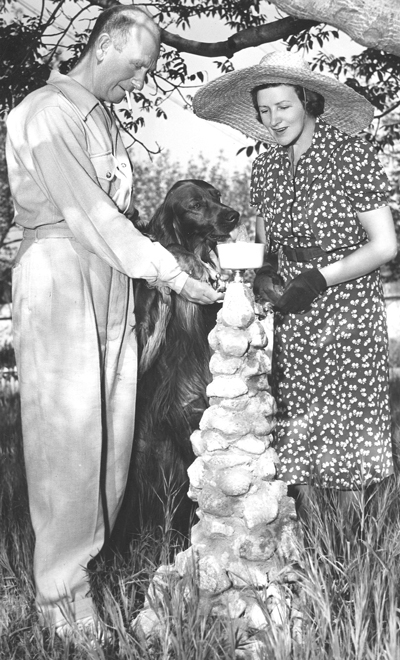 The other picture shows David, his wife and their dog at their ranch in the San Fernando Valley.